The McLaren F1, also known as The Gold Standard By Which All Other Cars Are Measured, famously has 627 horsepower raging out of its naturally-aspirated BMW V12. For the turbo BMW V8 in the new 2019 BMW M5 Competition, it has slightly fewer horsepower. In fact, just two fewer horsepower. It has 625 horsepower. You can see all of those horses in what appears to be, to my highly untrained eye, a lovingly photoshopped image at the top, courtesy of BMW. Those with calculator watches have probably already figured out that 625 horsepower is 25 horsepower more than the standard M5, but BMW didn’t just turn up the turbos on a laptop and slap a “Competition” badge on the thing. They’ve done all sorts of little, fiddly engineer-y things to make it all the more better. Yes, more better. You’ll see what I mean. The Competition’s peak torque of 553 pound-feet is now available in a 200-rpm wider rev range, from highway-speed cruising at 1,800 rpm to yelling away at 5,800 rpm. That enables it to absolutely launch to 60 mph in just 3.3 seconds – 0.3 seconds fast than a regular M5, and just 0.2 seconds slower than the vaunted McLaren F1. Normal humans will not notice such a difference, but you, the discerning M5 buyer, most certainly will. Especially because the Competition is just ever-so-slightly louder than the base model. Mmmmm toe links and ball joints. Yes. BMW has even gone so far as to stiffen up the engine mounts. The engine mounts! There weren’t really any complaints about a feeling that the engine itself was about to leap from the car, but now, you can rest especially assured. Though you may already know where all this is headed. We had already seen a leak of some of the specs, and already we had declared that the M5 Competition package wasn’t worth it. But now that we’ve seen all the details... nah, it still isn’t really worth it, whatever “it” is going to cost you, as the one specification BMW hasn’t released is the price. But frankly, that’s not the point. You don’t buy an M5 Competition looking for any sort of deal. Hell, you don’t buy a regular M5 for that. 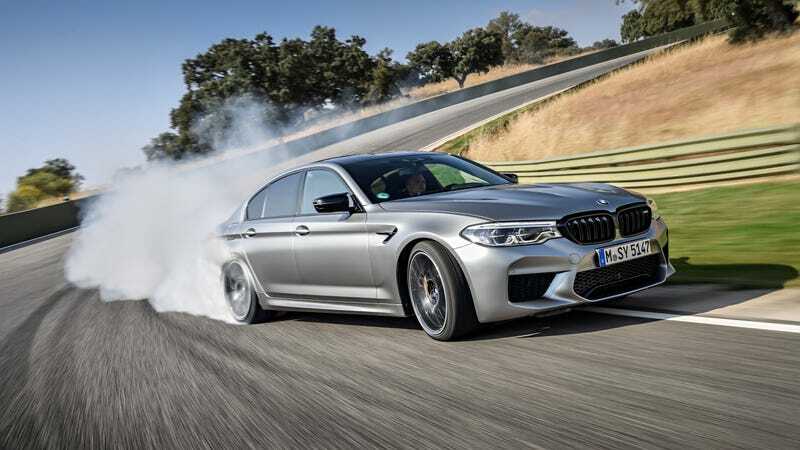 You don’t even buy them to go fast, as even the peasant’s base model M5 already has double the amount of horsepower necessary to go fast, and thus, it will always be driven slowly. You buy the M5, and thus the M5 Competition, because you want the most absurdly quick BMW sedan there is. You want to be the person bragging about the lap times. You want to be the person knowing you got THE BEST OF THE BEST. You want to be able to argue, however incoherently through a $600-per-bottle wine stupor, that YOUR BMW is TOPS, because it has THE MOST HORSEPOWER, if for nothing else that it has SLIGHTLY MORE HORSEPOWER than an Alpina B7, WHICH IS NOT REALLY A REAL BMW ANYWAY. And you don’t even care if the Alpina B7 ALSO HAS A HORSEPOWER FIGURE THAT BEGINS WITH A SIX AND ALSO HAS FUNKY LEATHER PILLOWS TO SERVE AS HEADRESTS TO GENTLY SWADDLE YOUR PRECIOUS NOGGIN. In fact, YOU DON’T CARE, YOU’VE GOT SO MUCH MONEY, YOU’LL BUY THEM BOTH BECAUSE SHUT UP. That’s what the BMW M5 Competition is for. CORRECTION August 7, 2018: BMW wrote us to say that these published figures are for the car in European spec. American cars are “rated differently” and our M5 Competition will make do with 617 horsepower but an identical 553 lb-ft of torque. This isn’t that our car has less power, it’s just that 625 metric horsepower (PS) translates to 617 regular horsepower (hp). Our American M5s also have a claimed 3.1 second 0-60 time, down from the Euro’s 3.3, which is likely because in Europe they measure 0-100 kph, or 0-62 mph more precisely.